Being successful with automation isn’t simply about learning the technical skills required to implement a solution. It’s also important to have good conversations with your colleagues and your managers so that they’ll have trust in the work you’re doing. If you can’t successfully communicate what you do and why, you may be the only person who thinks you’re an expert. Automation and Management from Joe Colantonio on Vimeo. 1) How do you decide what to automate? 2) How do you choose a tool? 3) How do you ask for investment? If you want to be seen as credible, to have people listen to you and be persuaded by what you’re saying, you won’t want to miss Katrina Clokie’s (AKA Katrina the Tester) session at the Automation Guild online conference for some practical ideas on what to consider when discussion these three topics with your managers. Whether it’s a manager requesting automation or you advocating for it yourself, you need to set a strategy for what your coverage is going to be. There are quite a few factors that can influence whether you automate something or not, and if you decide by yourself, in isolation, you’re probably going to get it wrong. Not Sure Where to Start Test Automation? Katrina suggests an excellent starting point that everyone should know before starting their automation. What Automation Tool to Use? Once you’ve decided what to automate, the next thing you’ll need to do is choose a tool or automation framework. In doing so you need to be able to advocate for the other aspects of the tool, beyond cost, and explain your reasoning as to why you think one tool is better than another. In Katrina’s session she touches on a few things she feels you should consider. This is the conversation where you leverage all the trust and credibility you’ve accrued in your previous discussions and basically ask for money from management to support your ongoing automation efforts. Often, people automatically think that investment is just about money, but you should be looking for both financial and time support. If you’re only discussing dollars and cents with your manager, you’ve missed a significant aspect of the investment actually required for effective automation. It’s a mistake many of us make, and Katrina shares some pointers on how to navigate the conversation to clarify to your manager all the things (besides money) that management needs to be committed to in order foster successful automation. When you’re beginning your test automation efforts and haven’t started creating tests yet, it may seem easy. Over time, however, test suites grow, and layer upon layer of chances are introduced that may make some of your tests unstable or even obsolete. But even when a test is obsolete, some test engineers continue to run them because no one actually takes the time to perform reviews every few months to ensure that what has been automated is effective, and that the test is still relevant. There are many things to consider, but luckily Katrina covers many of the top issues you might encounter and how to discuss with your manager before your automation gets out of hand. 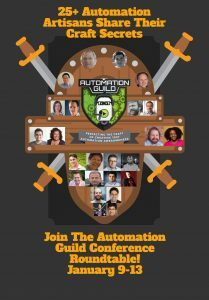 Make sure to register for Automation Guild to see this as well as 25 other awesome automation testing session that will accelerate your automation efforts in 2017.